PLA soldiers planed to cull glossy ganoderma and other rare medical herbs in the valley. Bearing guns and slings, they went down the valley. Again, they were forced back when they reached the sixth level. Even seen from there, the valley looked horrible and bottomless. Since then, Shentang Valley has become a world of mysteries and no man has set foot in it. About 500 meters from shentangwan lay "the Terrace for Mustering Officers". According to a legend, the son of heaven used to drill his soldiers and issue orders in this place. You may look at the peaks down there. At first glance, they look disorderly; on a closer examination, they look neat in its formation, dignified and energetic, going on an expedition. The West Sea is a basin-like landform with a collection of peaks and woods. In this "sea", numerous peaks stand with different shapes and poses, covered with lush vegetation. Therefore, it is called "sea of trees" and "sea of peaks". In spring or summer or a clear day immediately after a rain in autumn, the clouds are surging and rolling like waves, covering the whole sky and earth. The view is so magnificent that it is called "sea of clouds". The combination of the three seas is the characteristic of West Sea. In it, Gate to Heaven and Sky Terrace are wonderful scenes. It is the only cultural site on a big scale in Wulingyuan Scenic Area, the Bronze Statue of He Long, stands 6.5 meters high, weighing more than nine tons including horse. It is the largest and heaviest bronze statue shaped by Chinese in the past hundred years. 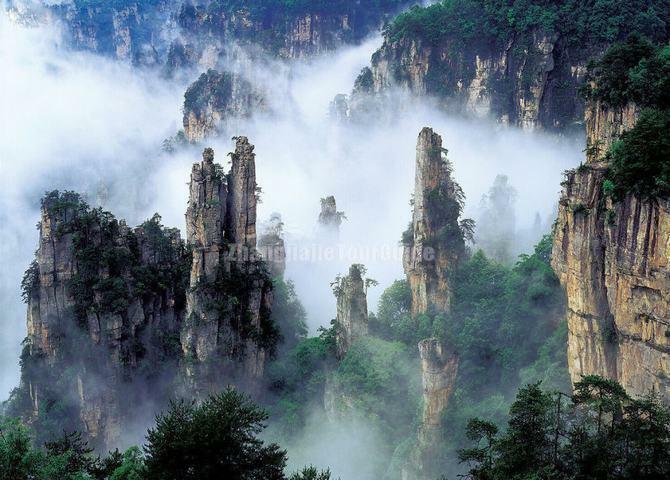 One of the ten tourism highlights in Wulingyuan. According to a legend, after his defeat, the Son of Heaven committed all of his official papers to the flames. As papers were burning, he caught a glimpse of a few royal writing brushes that evoke memories of the past. With these brushes, he gave orders, directing his armies. After his shameful defeat, he felt ashamed to see home elders. Acting on the spur of the moment, he angrily tossed the writing brushed into the valley. The moment the brushes landed, they were changed into a peak miraculously- The Imperial Brush Peak took shape. When veiled in a myriad of rays of the rising sun on a sunny day, the peak shines out with the dazzling brilliancy of ink remnants on its top. The Fairies Spreading Flowers is located in the diagonally opposite of The Imperial Brush Peak. There is a beautiful image of woman slim and graceful in the hazy mist, with flower basket in her arms, she smiles and put flowers on the earth. 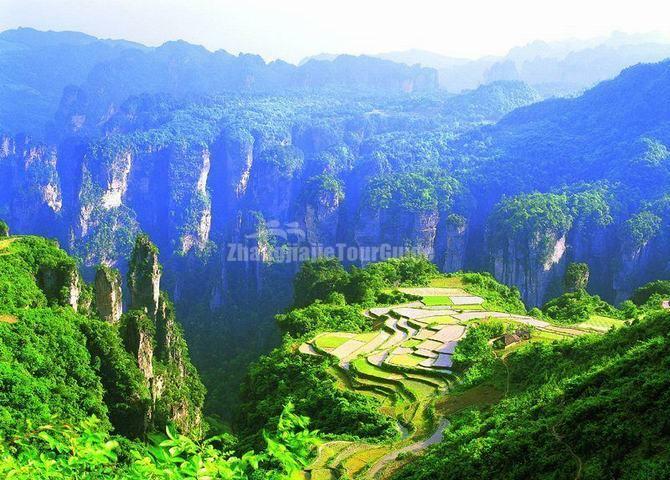 The Terraced Fields in the Air is located in the side of Tujia stockade, more than 1000 meters above sea level. There is a bottomless valley under it; hundreds of meters cliffs on the top of valley and a piece of 3 hectares slope trapezoidal fertile land on the cliff. Fairy Bridge is also called the first bridge in the world. Bridge is a natural formation, 26 meters long, 1.5 meters wide, more than a meter thick and about 60 or 70 meters high, erected on the overhanging precipices and steep cliffs on both sides, very lifelike. 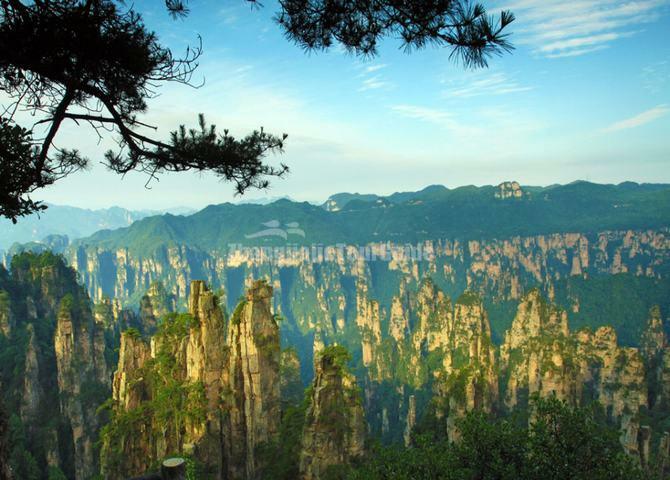 The ravine, densely lists hundreds of stone mountains, like the magnificent and mighty soldiers lined up to listen orders, according to legend, this is the Son of Heaven's Shen Bing in party. At the end of a long and narrow platform to the east, platform breaks into two peaks, the crack depth of 100 meters. The interval of two peaks less than 1 meter, separate stone peak about 10 meters long, 2 meters wide, is a perfect observation deck. There is a peak like a horse with raise its head, vibration mane and long shriek, beside it, there is a stone like a warrior holding the reins and saddling horse. According to legend, this is the mount and guard of the Son of Heaven. The General Rock, according to folklore, is the embodiment of the Son of Heaven. He wore golden armor, belly slightly bulging, stood with the hand in the back, the spirits, the charm, just like a general who conduct hordes and soldiers. 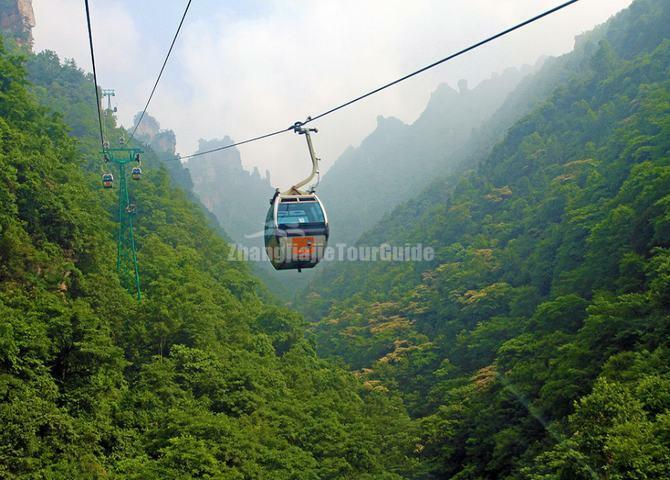 The cableway is located in the edge of the scenic spot, design horizontal line of 1960m, slash of 2084m, the altitude difference between both ends is 692m, with 41 single line automatic cycle carriages, each car holds six people, transport speed of 5 m/s, one-way traffic volume of 900 people per hour.